Have you made a business plan to cover you over the Christmas period? Whatever type of business you run, whether it be retail, production or service, you need to set out some plans to allow yourself to take a break over Christmas. Whatever your business, your opening hours will probably change over the festive period. Think about how you can best communicate that to your customers. If you are reducing your hours you can post your temporary hours on your social media platforms and pin the posts to the top of your page/feed. 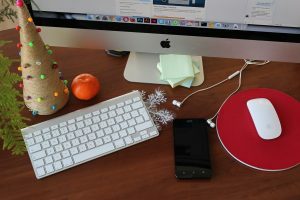 If you are completely shutting down for the festive period, put your out-of-office email response on letting customers know when you will be back to work after the break. It would also be a good idea to attach a post to your Google Local Entry as this can often be the first port of call for new customers. Think about what needs doing now before you take a break, action the important tasks that need to be done now and make yourself a list for January. Take some time think about the year ahead and give some structure to what you want to achieve in the new year. By making a plan for January you are allowing yourself to switch off over Christmas. Block out time to schedule your social media and blog posts over the break. If you run a small business you will need to check your social media platforms over the holidays but make a plan, perhaps one hour at the beginning of the day and then you can switch off. If you have a team, you can spread the task or indeed hire a VA! It only comes once a year so make the most of it, make the effort to go to those Christmas drinks and enjoy some festive cheer! Finally if there’s just too much to do, hire a VA: we have scheduled our team so there will always be someone around if you need Business Support or a Concierge Service.